In 1968, while still working with his father in his construction company, Mario Zodiaco saw the film "The Thomas Crown Affair", which starred Steve McQueen was using a buggy. It was love at first sight. He returned to see the film another 4 times and began to dream that maybe one day could hold one. Since it is not understood too well with his father at work, the same year Mario, decided to break away and open his own business. As his passion had always been his love for the engines, with little money and much sacrifice, opened in Bologna a small business buying and selling cars of all kinds, called "All Cars". The idea of the buggy was still latent in the minds of Mario and when he had time, California was purchased in a kit of basic buggy most classic of Dynamic, the "Desert" and sent him to Italy. When he arrived, he began to mount as it was to see inside, intending to sell it later to cover the enormous expense that it had accounted for its purchase at that time. Finally, in September 1968, the buggy was ready to go outside and perform the tests. It was great, the feeling of lightness and freedom was incredible. All expectations were met at the creature and Mario felt like a king. Arrived home and parked at the door (I lived in the center of Bologna). Began to hear constant touch horn from the street, thinking that this was an accident, dressed to see what happened, when he opened the door I could not believe what your eyes see, the traffic was blocked because a group people watching his new buggy. At that time, sensed the potential of that machine, and began to take the first steps to enter the market, and made contact with Beppe Seragnoli, owner of the company Marivan, builder of sailing boats. Produced two Mariver bodyworks. Now had to worry about obtaining all the other elements essential for the Buggy. The work was tremendous, especially if one takes into account that the money was available and very little during the day to survive had to continue selling cars. In May 1969 had two cars and found that all suppliers were required to start producing the Buggies. A few days later, she formed the Society Autozodiaco Srl "for building cars and merged the two names," All Cars "and" Autozodiaco "and sales would start in the small exhibition hall of the" All Cars ". In November 1969 introduced his buggy car into the Hall of Turin. The influx of visitors was very large and the events happened so fast. Now, everyone wanted a buggy, singers, actors, sports personalities in the world, etc ..., and especially with the help of advertising agencies to fame was the product shot. The problem now was the approval of the car. The Ministry of Transportation approval of the permit linked to the official interest of the Volkswagen as it is considered potentially dangerous. 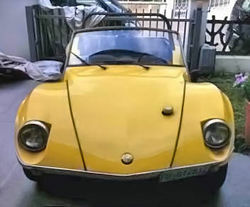 Volkswagen, was never in favor of the serial buggi with their engines, so when applying for the permit approval for a series production officially sponsored, it was denied. We can imagine his despair: the subject was resisting the move to a fortune, and could not do anything. Mario, promised to find ways to find a solution is clearly the problem. He moved to Rome at the headquarters of the Ministry of Transportation and requested access to all files of approvals granted between 1945 and 1969, found concessions for tractors, bicycles, etc ... finally after four days of research found one case in 1947 that sat in which was granted leave to transform American escavadoras truck, etc ... and found a way to overcome the legal obstacle. Indeed, in October 1969 was granted approval AZ 00001 * * dream was becoming reality! Now another problem arose: where to build the buggys and that money. Mario, partnered with his friend, Paolo Pazzaglia, whose profession was somewhat strange, "Play Boy" but belonged to a family well known and wealthy Bolognese with reaching an agreement which did not have to worry about anything, just of funding necessary to produce the cars so as to arrive later at self. Fortunately or unfortunately (as we shall see below) when it was announced to all potential customers of the buggies which began mass production, it received 109 orders in a few days which was achieved with the long-awaited self. Paolo Pazzaglia was not worried about anything, but still the owner of 50% of Autozodíaco. For commercial reasons the company took the name of Zodiac and obviously did not speak to the press. Pazzaglia then began to criticize and discredit Zodiac open and free to the extent that Zodiac was forced to liquidate by buying part of the Company. Strangely, Pazzaglia immediately accepted his departure and a settlement figure for the time was huge, about 80 million lire. Suddenly, one morning, the production manager phoned to tell a Zodiac that had disappeared from the garage of the office on the first buggy, especially with serial number AZ 00001. Called the police and made the complaint. The next day there was a tip saying that a number Buggy was in the garage Paolo Pazzaglia. Zodiac moved to the Village of Pazzaglia with his camera ready when it opened the door of the garage appeared buggy. Obviously it photographed and the picture again that the police obtained a search warrant of the house by the kidnapping of the buggy. But the serial number had been changed and printed in its place was a new acronym. A few days after the company was created; Automirage. Pazzaglia argued that for personal reasons was unable to continue the assembly of buggies, in other words, the former friend and former partner of the Zodiac buggy had stolen a number of very particular and thorough and I had prepared to be approved as quickly The new "Mirage" by Automirage. Pazzaglia plan was perfetto: Zodiac had left without building workshops where buggies, with very few resources and is more aware of all the sales organization. Fortunately, a few days, Zodiac reached an agreement with the owner of "Giannini," which at that time was devoted to preparing the Fiat 500 and immediately began assembling the first Autozodiaco model, the "Desert" in the factory Rome. Buggys assemble in Rome was a real agony and eventually moved the factory to Pianoro, 8 km from Bologna. The "Desert" in Autozodiaco (had inherited to the name of the Dynamic Buggy American), had a large list of options, wheels, hood, roof, hard types of brakes, paint, etc ... His weight was about 541Kg . In 1972, having made 700 "Desert", was presented DA.MA.CA. 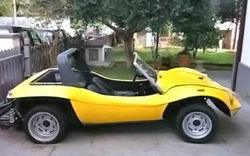 a Dune Buggy with a very sporty car, designed by Tom Tjaarda. The design of the back was slightly inspired by the De Tomaso Pantera. Equipped with engines of 1,500 cc and 1600 and its price stood at 1,798,000 lire. The name given by Damaca came during a contest organized by one of Autosprints Carlo Maddalena of Palermo. DA.MA.CA. is the composition of: DA.MA: (for Maddalena) and CA. (Carlo). Andalusia "Damaca" was followed by another sports model, the "Squalo, with aerodynamic front which had a price of 1,398,000 lire. Also in 1972 was presented Kit transformation "California" for VW. The last proposal was Autozodíado "Kirby" with mechanical Skoda 1100cc and 1000. Skoda wanted to build a buggy with his mechanics. The body was of a conventional type with a wide front air intake. It was announced at a price of 1,300,000 lire with new mechanics. In this car you could adapt an interesting and ingenious system for the rear wheels of the buggy for driving on snow. The sales were not bad and in 1973, Zodiac contacted BMW with which Italy reached an agreement for exclusive distribution of its cars through its sales network. Zodiac in the same year bought a small factory in Rubiera (between Modena and Reggio Emilia) and founded the "Motozodiaco" for the manufacture of motorcycles and tricycles with large wheels. In late 1974 he was offered a tempting offer to sell the factory and accepted. Later he partnered with his friend Sandro Munari to produce lubricating oils with Sandro Munari Motor Oil "and sports equipment with Sandro Munari Sport Line," to end organized the Bologna Motor Show in collaboration with Sandro Munari, Giacomo Agostini, Niki Lauda and Renato Molinari, which passed in 1981 to the current organizer Alfredo Cazzola. Since then Zodiac Italy left to wander the world in a sailing boat and to settle in Panama where he lived for years.